The long winter is almost over. It’s time to awake to spring. 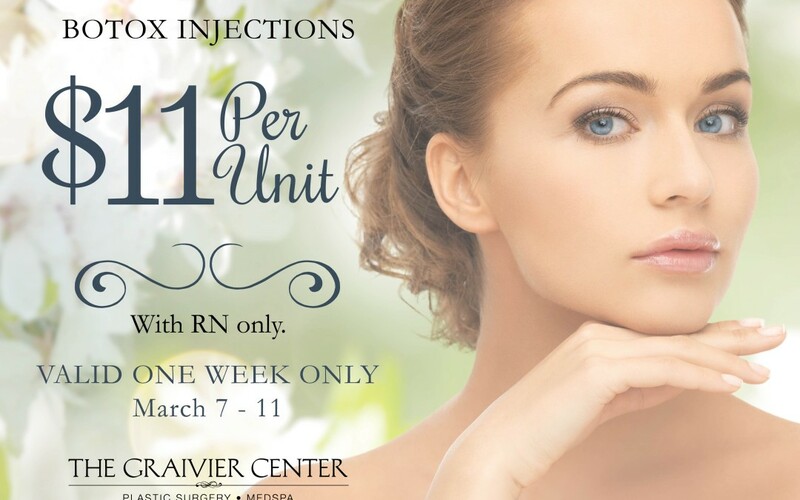 At The Graivier Center, we’re celebrating by offering our exclusive pricing on Botox® during the week of March 7-11. At only $11 per unit with a Registered Nurse, you’ll save money and have a fresh outlook on the season! The Graivier Center patients can save an additional $50 when they take advantage of a Brilliant Distinctions offer. During the month of March, Brilliant Distinction members will receive a $50 rebate instantly when they spend $200 or more on Botox®. Not a Brilliant Distinctions member? No problem! You can join now and still receive the savings! Join online before your appointment, or sign-up at our office. These special savings only happen a few times a year – don’t miss out! Schedule your Botox® appointment today for the week of March 7-11, and make sure to take advantage of the additional Brilliant Distinction’s offer! Call 770-772-0695.